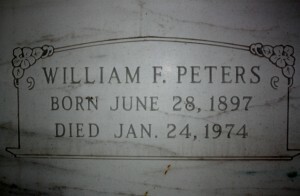 Funeral services were conducted a the Hack Funeral Chapel in Beecher on Sunday for William Peters, 17 West 32nd Street, Steger. The Rev. 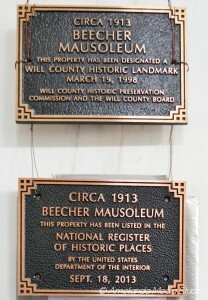 Armin Gottberg officiated, with burial in the Beecher Mausoleum. 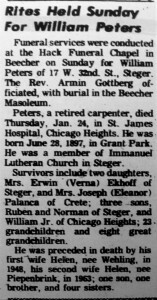 Mr. Peters, a retired carpenter, died Thursday, Jan. 24, in St. James Hospital, Chicago Heights. He was born June 28, 1897, in Grant Park. He was a member of Immanuel Lutheran Church in Steger. Survivors include two daughters, Mrs. Erwin (Verna) Ekhoff of Steger and Mrs. Joseph (Eleanor) Palanca of Crete; three sons, Rueben and Norman of Steger and William Jr., of Chicago Heights; 23 grandchildren and eight great-grandchildren. He was preceded in death by his first wife Helen, nee Wehling, in 1948, his second wife Helen, nee Piepenbrink in 1963; one brother, and four sisters. This entry was posted in Automated Burial Listing, Burial Listing, Burial Location, HEADSTONE, Immanuel Lutheran church - Steger, Obituary very limited by Sandra. Bookmark the permalink.